Handy, lightweight tablets have become a tool of choice for data collection, communication, and other numerous computing tasks. The tablet form factor has been recognized as the most suitable design for many tasks on the road and on the job. Since many of these jobs are outdoors where it is exposed to moisture, hot and cold temperatures, as well as getting dropped and rattled around, there is now a need for tablets that are tougher than a user can find from consumer based tablet company. 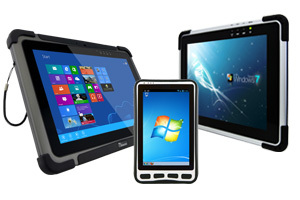 Winmate's Rugged tablet PC lineup is perfectly suited for such environments. Our Rugged lineup comes in either an IP54 or IP65 rating and can withstand drops up to 4ft; user no longer need to worry about those accidental drops that would normally leave a consumer tablet broken and unusable.